EAST VILLAGE — Since announcing Club Foot's impending closure two months ago, every day has been "like New Year's Eve," the co-owner of the beloved dive bar said. On Friday, East Village's Club Foot, which is shuttering just two months before its 20th anniversary, will celebrate its last night, followed by an invitation-only party on Saturday and a nearly two-week-long garage sale. "The outpouring of support has been overwhelming, like New Year's Eve every day. I was not prepared for the volume of people. 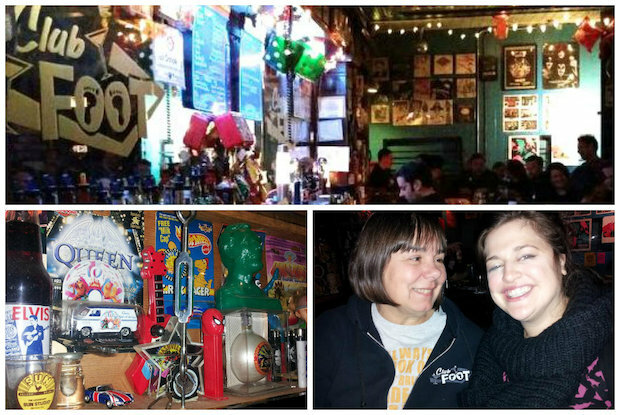 Some are flying back [to Chicago] to say goodbye," said Lauree Rohrig, co-owner of Club Foot, 1824 W. Augusta Blvd. Rohrig and her husband, Chuck Uchida, met in the late '80s and worked as DJs in the early '90s at Club Dreamerz, which is now Nick's Beer Garden at 1516 N. Milwaukee Ave. In January of 1995, Uchida and Rohrig bought the bar, on the northeast corner of Augusta Boulevard and Honore Street. Over the years, Club Foot, known for its dance parties and collection of retro toys filling the walls, has been a launching pad for friendships and relationships. "People tell us they came in here and met their first friends in Chicago. It was a comfortable bar; you felt safe," Rohrig said. Recently, Jill Petrowsky and her husband, Chip Medema, flew in from New York City to spend their entire week bidding goodbye to the bar where they met in 2011. "This is family. Chuck and Lauree created a community that is more than a bar," Petrowsky said. Bart Harvey, a Ukrainian Village resident, said he lived in an apartment above Club Foot in the late '90s and worked as a volunteer bouncer two nights each week in exchange for drinks. "I learned to pick up girls here," Harvey said. Tina Benitez, 37, a Wicker Park resident, said she will be retiring from bartending when Club Foot closes its doors. "Ninety percent of the people [who come here] are regulars. I didn't call them my customers when I was bartending, they were my friends," said Benitez, who has tended bar at Club Foot on Monday nights for the last five years. Club Foot's closure, which owners say was prompted by a rent increase, follows other popular dive bars such as Marie's Rip Tide Lounge in Bucktown, which closed last August; Hungry Brain in Roscoe Village, set to close in December, and Beachwood Inn, which has a sale in the works. "I don't think there will be places like this much anymore. People don't care about tavern culture, where you sit and talk to each other. They just want a sports bar to watch TV or to sit and look at their phones," Rohrig said. Recently, Rohrig said she and Uchida were debating whether to offer Wi-Fi in the bar and ultimately decided against it. "It's about being together with people, not being on the Internet while you're in a bar, being on Facebook," said Rohrig, who still uses a flip phone. Uchida said he will "miss the variety and quality of people" that have passed through Club Foot. "I will also miss the fact we created a place where people feel comfortable instead of feeling like they have to live up to the reputation of the place," Uchida said. Beginning Monday, Club Foot's garage sale will run from 2 p.m. to 10 p.m. daily through Nov. 29. Toys, records, bar supplies, stools, tables and "everything," will be on sale, according to a flier. Club Foot, at 1824 W. Augusta Blvd., will celebrate its last night in business from 8 p.m. Friday to 2 a.m. Saturday morning. The bar will be closed for a private friends and family party Saturday. Beginning Monday, Club Foot's garage sale hours will be 2 to 10 p.m. daily through Nov. 29.